After dropping off your passengers, you taxi to the gas pumps to top off your tanks. You then park the airplane at the edge of the transient ramp, and stroll over to the nearby hangar for a cup of coffee with a few mechanic friends. Back at the general aviation terminal, you use one of the phones to check on the weather. As expected, there are no significant developments in the weather, so you simply add a few notes to the briefing form you used for the inbound trip. 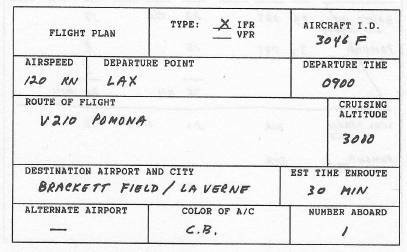 While on the phone, you also file your IFR flight plan, requesting Victor 210 to Pomona and estimating a 9 a.m. departure. The only real difference you expect going back is that the flight should take a little longer because the runway directions will be “wrong” for the east-bound heading. Four Six Foxtrot, stand by one. To follow the parallel taxi strip. Four Six Foxtrot Tower on one two zero point niner five so long. 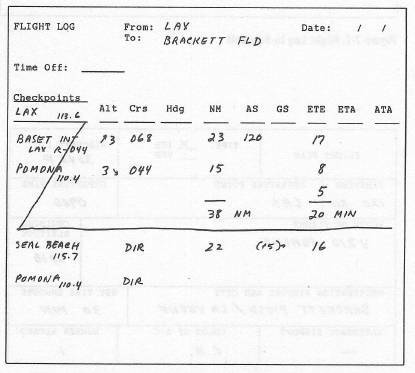 Four Six Foxtrot Los Angeles Tower position and hold. On one twenty-five point five see ya. You now inform Approach you wish to leave the frequency briefly. You switch to Com 122.95 for Brackett Unicom and receive a message from one of your partners requesting you to stop at Ontario International to pick up an engine part from Ryan Aviation. 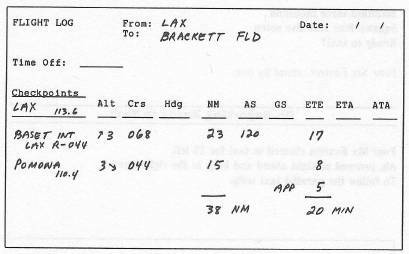 Accordingly you return to the Approach frequency and request an amended flight plan for a landing at Ontario instead of Brackett. The controller tells you to “stand by one” and gives you your amended clearance. Ground on one twenty-one point niner see ya. Four Six Fox cleared to taxi to Ryan. You've indicated your destination as Brackett Field. Contact Tower on one two zero point six so long. Switch. Report your position and intention to land. Four Six Foxtrot Ground you're cleared to Clipper.